Sat:27:Dec:08 - 808 State Live - Glasgow Academy - Glasgow. (initially was 27:Dec Print Factory, then 13:Dec Print Factory). Old flyer. Fri:19:Dec:08 - 808 State DJs - Rainbow Warehouse - Birmingham. Sat:06:Dec:08 - 808 State DJs - Vivaz - Scarborough. Sat:29:Nov:08 - Sisters Of Transistors - Club Brenda @ The Deaf Institute - Manchester. Thu:20:Nov:08 - 808 State DJs - Sala Palace - Madrid - Spain. 19-22:Nov:08 - Toolshed, SOT, Biting Tongues, Massonix, Spaceheads - London. Fri:14:Nov:08 - 808 State Live - Bestival Reunion - Crawdaddy - Dublin - Ireland. Images. Sat:08:Nov:08 - 808 State Live - Creamfields - Buenos Aires - Argentina. Tue:14:Oct:08 - Sisters Of Transistors (supporting The Aliens) - Hoxton Bar - London. Tue:07:Oct:08 - Toolshed - Trinity Church, Salford. Mon:06:Oct:08 - S.O.T., Academy 3 - Manchester. 01-04:Oct:08 - Toolshed, Biting Tongues, S.O.T., Massonix etc. - Shunt - London. Sun:21:Sep:08 - 808 State DJs - City Hall - Barcelona - Spain. Sat:06:Sep:08 - 808 State Live - Bestival (5-7 Sep) - Isle of Wight. Thu:04:Sep:08 - Graham Massey & friends - Manchester Art Gallery - Manchester. Sun:24:Aug:08 - 808 State DJs - Cotton Factory - Huddersfield. Sat:16:Aug:08 - 808 State DJs @ Ultradog - Paradiso - Amsterdam - The Netherlands. Fri:08:08:08 - 808 State DJs - Nitefreq @ Jack's - London. Fri:01:Aug:08 - Sisters Of Transistors - Fabric - London. Fri:25:Jul:08 - Sisters Of Transistors - The Green Windmill - Manchester. Tue:22:Jul:08 - Two Grahams @ Royal Northern College of Music - Manchester. Fri:04:Jul:08 - 808 State DJs - Monkey Bar - Swansea. Sun:29:Jun:08 - Toolshed - Hackney Empire - London. 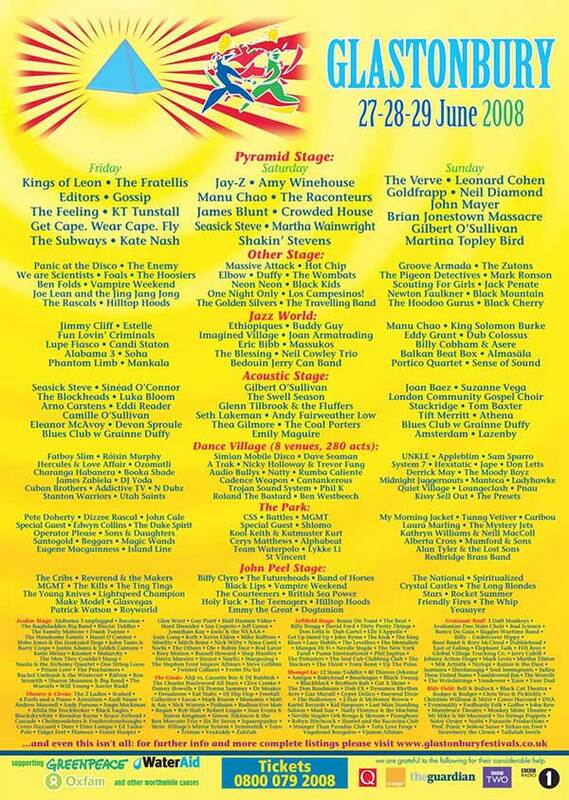 Sat:28:Jun:08 - Massonix - Glastonbury Festival - Glastonbury. 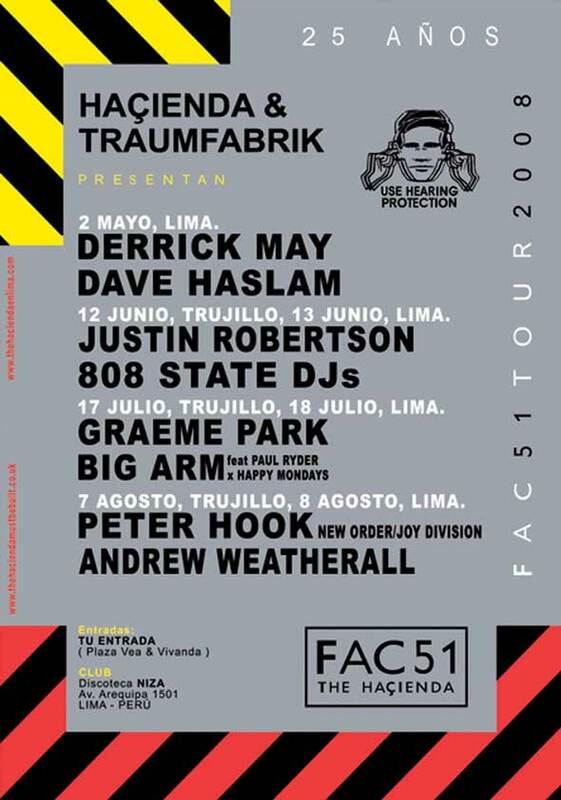 Fri:13:Jun:08 - 808 State DJs - Lima - Peru. Thu:12:Jun:08 - 808 State DJs - Trujillo - Peru. Sat:31:May:08 - 808 State Live - Primavera Sound Festival - Barcelona - Spain. Discussion. Tickets. Sun:25:May:08 - 808 State Live - Gatecrasher Summer Sound System - Brackley. Discussion. Tickets. Fri:16:May:08 - Sisters Of Transistors - Chorlton Arts Festival - St Clements Church - Chorlton. Sat:10:May:08 - Sisters Of Transistors - Queering The Pitch - Academy 3 - Manchester. Mon:05:May:08 - Sisters Of Transistors - Futuresonic Festival - The Deaf Institute - Manchester. Sun:04:May:08 - 808 State DJs - Kasbah - Coventry. Sat:03:May:08 - 808 State DJs - Junction - Cambridge. Mon:28:Apr:08 - Massonix (w. Autechre) - Liquid Room - Tokyo - Japan. Sat:26:Apr:08 - Massonix (w. Autechre) - Club Karma - Osaka - Japan. Fri 25:Apr:08 - 808 State DJs - Bench aftershow - Manchester. Thu:17:Apr:08 - Massonix (w. Autechre) - Black Cat - Washington - USA. Wed:16:Apr:08 - Massonix (w. Autechre) - Transit - Philadelphia - USA. Tue:15:Apr:08 - Massonix (w. Autechre) - Music Hall of Williamsburg - Brooklyn - USA. Mon:14:Apr:08 - Massonix (w. Autechre) - Middle East Downstairs - Cambridge - USA. Sun:13:Apr:08 - Massonix (w. Autechre) - Club Soda - Montreal - Canada. Sat:12:Apr:08 - Massonix (w. Autechre) - Lees Palace - Toronto - Canada. Fri:11:Apr:08 - Massonix (w. Autechre) - The Abbey - Chicago, USA. Tue:08:Apr:08 - Massonix (w. Autechre) - Richards on Richards - Vancouver - Canada. Mon:07:Apr:08 - Massonix (w. Autechre) - Neumos - Seattle, USA. Sun:06:Apr:08 - Massonix (w. Autechre) - Doug Fir - Portland, USA. Sat:05:Apr:08 - Massonix (w. Autechre) - Mezzanine - San Francisco, USA. Fri:04:Apr:08 - Massonix (w. Autechre) - Echoplex - Los Angeles, USA. Fri:04:Apr:08 - 808 State DJs - Gatecrasher - Nottingham. Sun:23:Mar:08 - 808 State Live - The The Hacienda Warehouse Party - Manchester. Also featuring: A Guy Called Gerald live, Shaun Ryder live PA, Mike Pickering & Graeme Park, Peter Hook. Tickets. Discussion. Sat:22:Mar:08 - 808 State DJs - Discoteque - Leeds. Sat:08:Mar:08 - Sisters Of Transistors - Club Motherf**ker @ Barden's Boudoir - London. Fri:29:Feb:08 - The Sisters Of Transistors - King's Arms - Salford. Sat:02:Feb:08 - Sisters Of Transistors - Razor Stiletto @ DQ - Sheffield. Sat:26:Jan:08 - 808 State DJs - Moxa Club - Mantova - Italy. Fri:11:Jan:08 - 808 State DJs - Bang Face - London. Photos.